Many killifish, which are also known as egg-laying tooth carps, have vivid colouring, some with eyecatching red, blue, or iridescent bluish-green markings. They have the advantage of being relatively small so may be kept in quite a small tank, and they will often spawn fairly readily. In general, killifish are not difficult to maintain, but they do have fairly specialized requirements, so are not usually suitable for inclusion in a typical community aquarium. This group includes the remarkable annual killifish, so named because of their brief lifespan and unusual breeding cycle, geared to the seasonal changes in their natural habitat. These fish have adapted to ensure the survival of the species when the older generation are killed off all at once by drought, leaving behind their dormant eggs to hatch when the rains return. These killifish inhabit shallow pools which dry up in the summer heat. As the water in their pools starts to evaporate, the adult fish are triggered to spawn before they inevitably die. Their eggs are buried, encased in mud at the bottom, and here they remain until the rains come, refilling the pools. At this stage, the fry emerge, developing rapidly because they must mature and breed before the water level falls again and they in turn die. While these fish are at the mercy of their harsh environment in the wild, in an aquarium they may actually live for several years. Their eggs may also remain viable for several years, so unlike other fish, they can be purchased in the form of eggs, which are sold in peat and are easy to transport. In an aquarium, you can encourage some killifish to breed as they would in the wild, but some types will happily lay their eggs among aquatic vegetation instead. 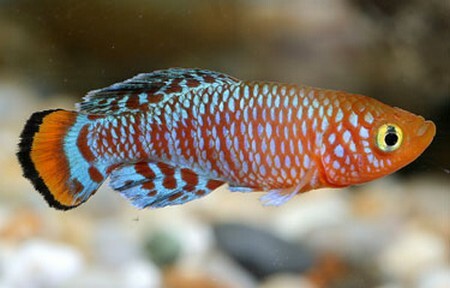 One example of this is the gularis (Aphyosemion gulare), a killifish with a wide variety of appearance among individuals. Some captive strains now tend to be quite yellow, with purplish markings on their bodies, while others are partially blue, with red blotches. Gularis may be quite aggressive, so it is best to separate the males, housing one in the company of several females. Walker’s aphyosemion (A. walkeri), in contrast to gularis, is a dedicated substrate spawner. For these fish, you need to provide soft water conditions, mimicking those of the rainwater that fills their pools, while a layer of peat at least 2.5cm (1in) deep is recommended for the aquarium floor. To encourage spawning, the water level should be lowered; because of this, it is preferable to use an external heating pad placed under the aquarium, or at the back, rather than a tubular heater which could be exposed to the air as the water level falls. Once the fish have spawned, they may be transferred to separate quarters, leaving the water in this aquarium to evaporate. Keep the surface just slightly damp -using water that you have first dechlorinated – with a plant mist-sprayer if necessary. After an interval of at least one month, you can flood the aquarium again, using soft, conditioned water. The killifish fry should then begin to hatch quite rapidly. 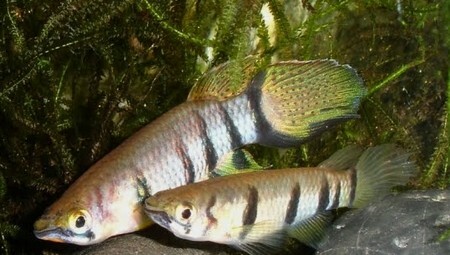 Among the other annual killifish that are often kept in aquaria are members of the genus Nothobranchius, such as Guenther’s nothobranch (N. guentheri). They are frequently very colourful, especially in the case of males. As with other killifish, make sure that live food is a significant part of their diet. Including plenty of vegetation in their shallow aquarium should decrease the level of aggression among the male killifish. It is advisable to change their water regularly. The eggs of these killifish often take longer to hatch than for Aphyosemion species: up to six months is not unusual. Allow four months before adding fresh water, and the fry should start emerging after about a month. African relatives. These are recognizable by their spotted appearance. Similar conditions as for African annual species are required, although the New World killifish will often tend to take longer to hatch. It is worth drying out the substrate a second time once all the fry seem to have hatched, and then flooding the surface again, as more young killifish may well emerge. This delayed hatching of a proportion of the eggs is a natural feature, providing the species in a particular locality with a second chance of survival should there be inadequate rainfall at first, with the water evaporating before the fish can complete their lifecycle. There are other killifish which inhabit permanent areas of water and breed in a more conventional way, rather than spawning in the substrate. These include other members of the genus Aphyosemion, such as the striped aphyosemion (A. striatum). This is one of the species that will benefit from the addition of some marine salt to the aquarium water, because this minimizes the risk of their succumbing to a fungal infection. Regular partial water changes are also helpful in this respect. They typically lay their eggs on fine-leaved plants, doing this gradually over several weeks in the case of some species. The eggs should then be transferred to a separate tank for hatching, otherwise the young fry are at risk of being eaten by the adult fish.